Baseball players earn their nicknames. Most of them have all kinds of names, some of them famous, some of them not so famous. Harmon Killebrew was known as "The Killer" and you might be thinking that it has to do with his last name. Well, that would be right in part, but it would not be the whole story. No, Harmon Killebrew was famous for "killing" his opponents both with his hitting and his fielding. Now that spring training is coming to an end and the regular season is set to start in the majors, it is important to look back at the greatest players, like The Killer, those who showed up each year to spring training with high expectations and a desire to improve. Killebrew started his major league career with the Washington Senators. Due to rules in place at that time, he was able to jump right from being drafted to playing in the majors, rather than spending time in the minors. He made his debut at the plate just four days after he signed the contract with the Senators and six days before he even turned 18. He was the youngest player in major league baseball. In those first two seasons he batted .215 had 93 at bats, struck out 34 times, had four home runs and played defensively at third base. Those numbers were not nearly impressive, and we wouldn't be talking about him now if things continued that way. Eventually, the Senators sent him down to their farm system. He came back to the majors in May of 1956. Once again, his numbers were not exactly impressive. He batted only .115 through the middle of June and was sent back down. During the 1957 season, he was sent back to the farm teams and ended up with a very productive year . He had a league-high 29 homers and 101 RBIs and even got to play in the league All Star Game. He also became the first-ever player to hit a baseball over the centerfield wall at Engel Stadium - 471 feet from where he stood at home plate. 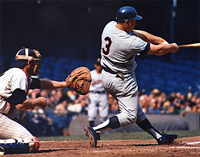 From that point, there was no looking back for Harmon Killebrew. He became the Senators starting third basemen in 1958, after the team changed managers. From May 1 through through the 17th he had five multi-home run games and even notched a five-RBI game on May 12. By mid-season of that year he had amassed 28 home runs. He finished that season with 42 home runs which tied him for the most home runs in the American League. The Harmon Killebrew, the Killer, had arrived. The Senators moved their franchise to Minnesota and became the Twins. The Killer went right along with his team, and any fears that the change of venue would hurt his career soon went out the window. He played for the Twins until 1974. He spent one more season in the majors, playing for the Kansas City Royals, and then retired. The Killer had an overall batting average of .256 and 573 home runs. His bat notched 1,584 RBIs. He ended up on 13 All Star teams and was the American League MVP in 1969. In 1971 he earned the Lou Gehrig Award and eventually the Minnesota Twins retired his number 3. Harmon Killebrew missed three times for the Hall of Fame before finally earning enough votes to get a slot. That was in 1984. He became a broadcaster for the Twins, the Oakland As and the Angels. He died of cancer in May of 2011. He has a charity, that is still active to this day that contributes to a large number of causes.